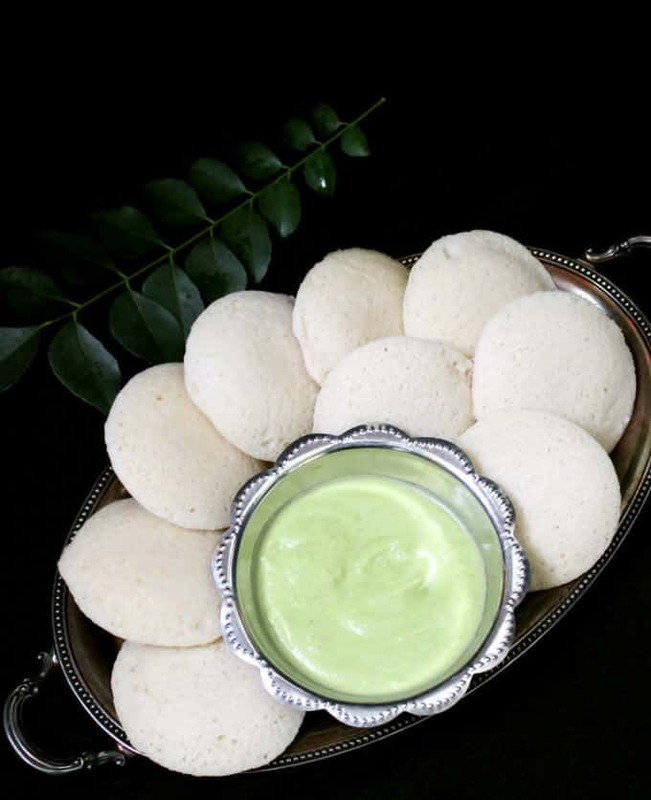 These delicate, fluffy, moon-like Idlis are not just fun to eat, they are really great for you too. 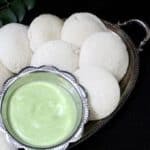 If you love fermented foods and understand the immense benefits they bring to your health, you should be making Idli, a five-ingredient dish that originated in south India and has dug roots in kitchens across the rest of India and in Indian kitchens around the world. Even if you aren’t Indian, you’ve likely at least eaten an Idli at an Indian restaurant. This porous, fluffy white disc could easily be the healthiest food in the world and it is made of two basic and very healthy building blocks — rice and lentils. Eaten by itself, an idli tastes bland. But served with a sambar and a green coconut chutney, it becomes one of the most delicious foods you will ever eat. This is also food for everyone. Gluten-free? You can’t do better than an idli with its perfect-protein combination. Trying to lose weight? 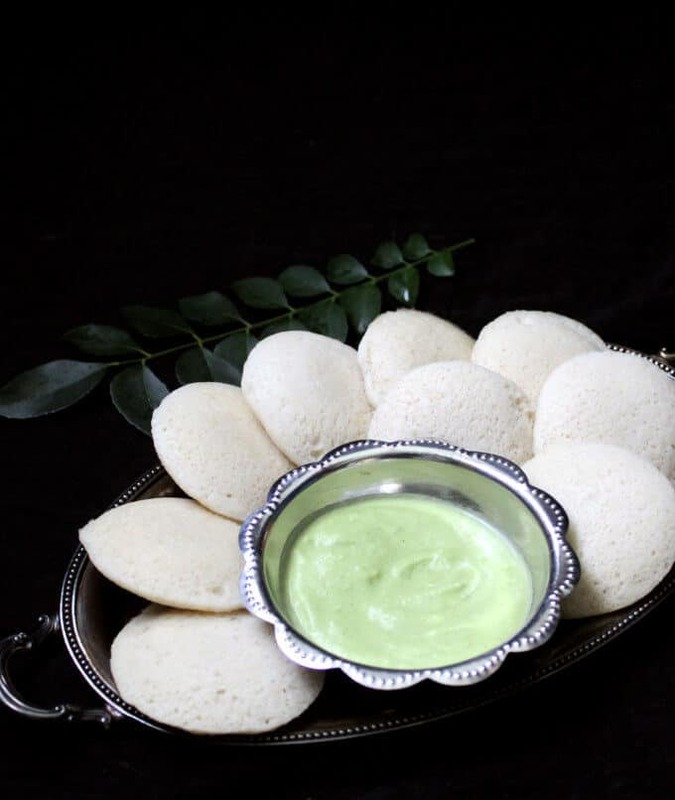 Idlis are extremely low-calorie, fat-free and probiotic. Sick? An idli will nurture your digestive system right back to health. Picky eater? No kid can resist a soft little moon to dunk into creamy, savory, green coconut chutney. 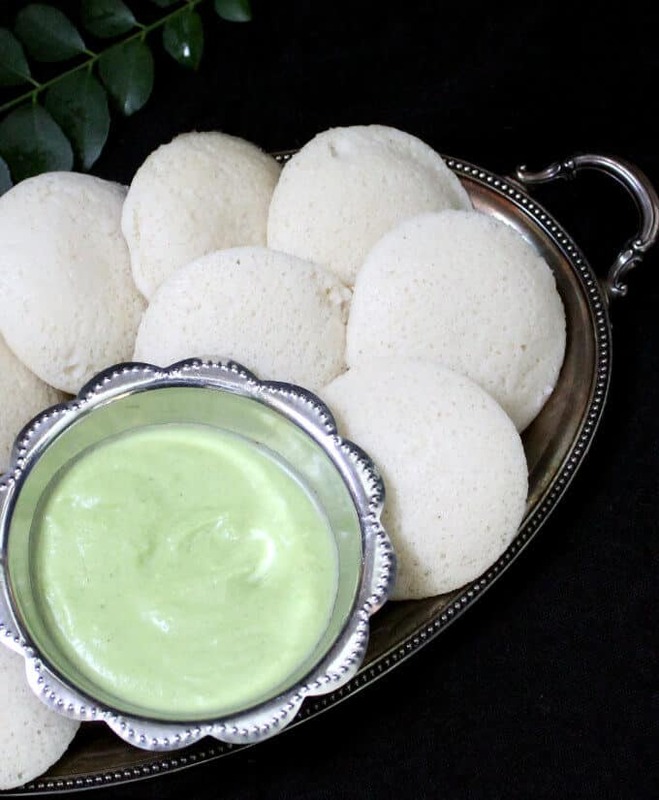 There are many kinds of idlis, but the recipe I have for you today is for a basic Idli — the only way Idli was eaten before people started adding oats or cream of wheat or whatever to gild its perfection. And while I’m just as guilty as the next cook of improvising, this is also the idli recipe that gets made most in my home, because you never really can best a classic, can you? Making an idli sounds simple enough, but for me, finding the perfect idli recipe was more challenging than finding the perfect dosa recipe. Both dosa and idli batters are made with rice and lentils, and both are typically fermented, but while a dosa is cooked into a crisp, golden crepe on a griddle, an idli is cooked by steaming it in a special mold. This means your idli batter has to be just so. Otherwise your idlis either won’t set or they will harden up to the point where you simply won’t enjoy them. Don’t let that put you off, though, because I’ve done all the hard work for you. 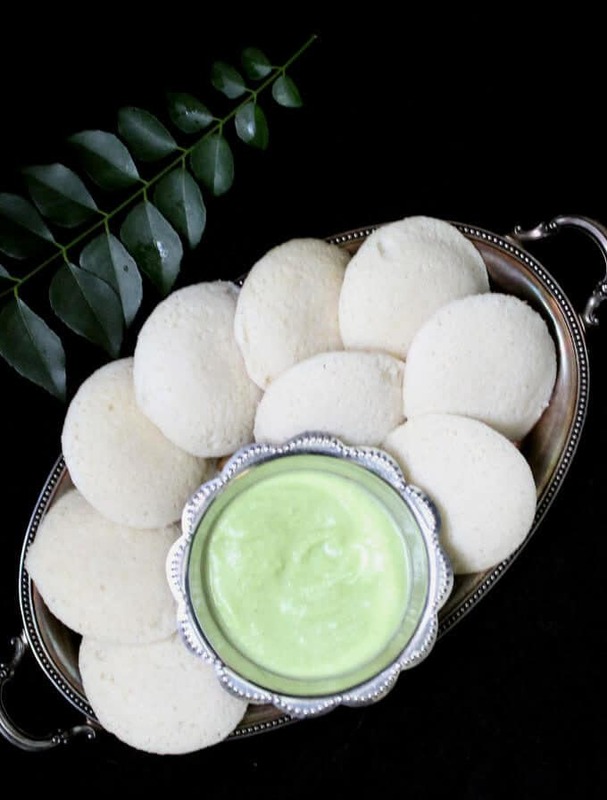 If you follow instructions carefully, and make sure you use all of the ingredients in the exact proportions and follow the right times for soaking your rice and lentils and fermenting the batter, you can have the perfect idlis and eat them too. My idli recipe is also healthier, because it’s made with brown rice. I use the brown rice in combination with the parboiled rice that’s typically used for idli-making, and there’s tons of healthfulness added to an already nutritious recipe with no loss in flavor or texture. I also toss in a handful of flattened rice or poha, which I told you about not long ago in this Kande Pohe post, because it greatly improves the texture and fluffiness of the idli. You also need the fenugreek seeds to help the good bacteria thrive and flourish. All of these are easily available at Indian groceries or online. You need to soak your black gram lentils (udad dal) and the two rices — brown rice and parboiled rice — separately and overnight. Soak the poha or flattened rice and the fenugreek seeds with the udad dal. Overnight is great, but you can also do this for about six hours in the daytime. Once your lentils and rice have soaked, drain them and then grind them, again separately. The texture you grind each to is important for how your idlis will turn out, so don’t try to make quick work of it by grinding them together. The lentils have to be ground into a very smooth paste, while the rice needs to be just slightly coarser. Once you’ve got both to the right texture, you mix them in a large bowl and set the batter aside to ferment for about eight hours, preferably in a warm place or in the oven with the pilot light turned on. 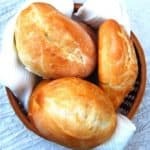 Once your batter has fermented, you will see it. The batter will look puffy and will rise quite a bit (it’s a good idea to put a plate or a baking sheet under the bowl — I’ve had to deal with an overflow of fermented dosa batter in the oven and it was NOT fun to clean up). You do need an idli mold like this one to steam your idlis, — it’s not very expensive and it’ll last you a lifetime. A pressure cooker would be great, but is not absolutely necessary. 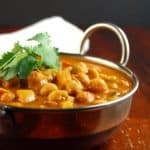 If you use a pressure cooker, you need the Indian kind — the one that has a vent at the top on which you place the pressure regulator or “whistle”. This is because you don’t really want to pressure cook your idlis– you want to steam them, so you don’t need to put on the pressure regulator. I’ve steamed my idlis in a stockpot large enough to hold the mold and with a lid that lets steam escape and they turn out fine. If you do use a stockpot, set it on a trivet (like those used in steamers) placed in the bottom of the pot — make sure it sits comfortably in the bottom of the pot. When your batter is ready, lightly coat the individual plates in the mold with cooking spray. This is not absolutely essential, but it’s something my parents did, and it makes the idli really easy to slide out after it’s steamed. Now fill each little mold with the batter, stopping just short of filling it all the way up, because the idlis will puff up a little as they steam. To make the process of easier, I start out by filling the plate at the bottom, then place the second plate on top, fill that up, slide in the third, fill it up, and so on. If you were to fill in the molds first and them put the whole thing back together, you’d have a mess on your hands. Place the trivet in your pressure cooker or stockpot and add about an inch of water. Now place the idli mold on top of the trivet, put on the lid of the pressure cooker (without the pressure regulator on) or stockpot, and turn on the heat to medium-high. When you see wisps of steam beginning to escape from the vent on the pressure cooker or in the lid of your stockpot, set your timer to 10 minutes. Once your timer goes off, turn off the heat. I let the idlis stand in the stockpot for a couple of minutes, then carefully remove the mold and let them stand at least five more minutes before sliding them out. You need to apply light pressure with your fingers at the corners to ease the idli out. What do you serve with idli? I made a coriander-curry leaf chutney that is more traditional, and I’ll share that recipe with you soon. Meanwhile, here is the recipe for a really delicious, fluffy, amazing idli that’ll go right to the top of your list of breakfast favorites. Place the black gram lentils in a bowl with the flattened rice and fenugreek seeds and cover by at least two inches of water. Set aside to soak at least six hours or overnight. Mix the parboiled rice and brown rice in another bowl and cover them with at least two inches of water. Set aside, again for at least six hours or overnight. 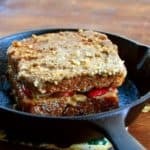 Drain the lentils and grind them in a high powered blender, adding just enough water to get a batter that's the consistency of a thick pancake batter. The batter should be very smooth. Remove the batter to a large bowl. 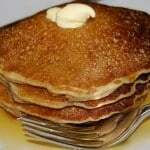 Add the rice to the blender, again with enough water to create the consistency of a thick pancake batter. 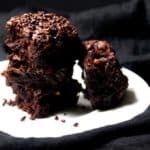 This time, grind until the batter still has a slight coarseness -- you don't want to see broken grains of rice, but the batter should have a slight grittiness, like that of cornmeal, when you rub it between your fingers. Add the rice batter to the lentil batter and mix them both, preferably with your very clean hands. The reason for this is that the warmth of your hand helps start and hastens the fermentation process. Cover the bowl very tightly with cling wrap. Your bowl should be large enough that the batter reaches only half way up because the batter will rise. If you're not sure, slide a plate or a baking sheet under your bowl to catch any overflow. Place the bowl in a warm place or in a cold oven with the pilot light turned on and let it stand overnight or at least eight hours. By that time it should have become puff and risen. 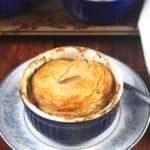 In a large stockpot with a vented lid that lets steam escape, or in a pressure cooker with a removable pressure regulator, place a trivet and an inch of water. Spray the idli molds lightly with cooking spray and fill them up, stopping just short of filling them up all the way because the idlis will puff up a bit as they steam. I first fill in the bottom-most plate of the mold, then slide on the second one, fill it up, slide on the third, fill it and so on. Place the idli mold in the stockpot or pressure cooker and cover with the lid. Do not put the pressure regulator on the pressure cooker vent. Place your stockpot or cooker on medium-high heat. When you see wisps of steam rise from the vent in the lid or the pressure cooker, set the timer to 10 minutes and let the idlis steam away. 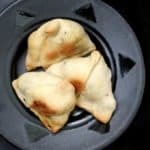 At the end of 10 minutes, turn off the heat and let the idlis stand for a couple of minutes before opening and removing the mold. Disassemble the mold and let the idlis stand in the plates for another five minutes or so. Then slide them off, either with your fingers or with a spoon. hi vaishali, can i use unclebens parboiled rice for the idlies. Yes, I use a variety I buy at supermarkets here too– not necessarily the one from the Indian grocery store. Can’t wait to try. After failing 3 times i have given up making idli’s. Made Ragi idli batter yesterday. When do you add salt. I was told to add salt after fermentation by some and after grinding from few friends😩😬😂 Don’t see salt in your recipe?? Hi Alamelu, good luck! 🙂 I don’t add salt to my idlis, just so we can cut down on the sodium and because the chutney and sambar have it. But if you want to add, definitely add it after the fermentation because salt can inhibit the growth of the good bacteria. Cheers. 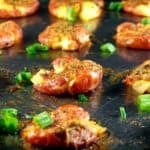 I am getting hungry just looking at these. I love love love idlis. there’s south Indian restaurant where I live and it’s always the first thing I order. I am definitely going to try! Hi Krithika, The rice needs to be a little coarser — not in large pieces, but like liquid rava. I used to grind the rice very smooth too before realizing my mistake.